With the help of interns, Roman DePaz and Tizzle O’Donnell, from Patagonia’s Boston store, Steve Hurley surveyed the Pocasset River in Bourne, MA. 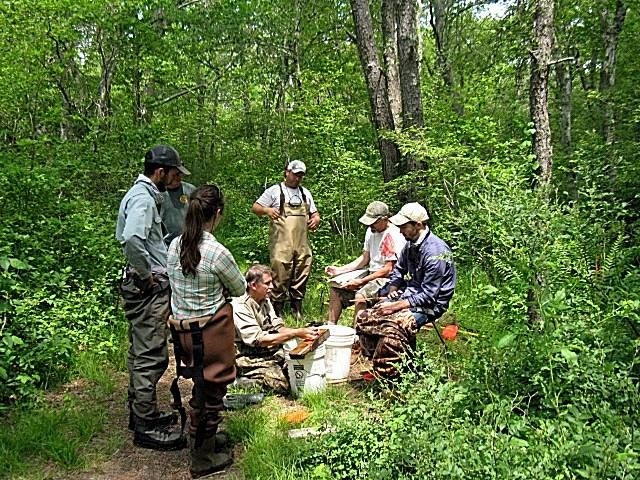 The Pocasset was dammed to create four ponds for a private fishing club, an act that reduced the river’s wild brook trout habitat to a small reach of its headwater. The club folded in the 1920s, but the dams and ponds remain. Steve had found trout in 1993, and he found them again on Thursday – 45 in the short 60 meter reach that was surveyed. We don’t know how long the trout supporting section of the river actually is. That is a project for another day. 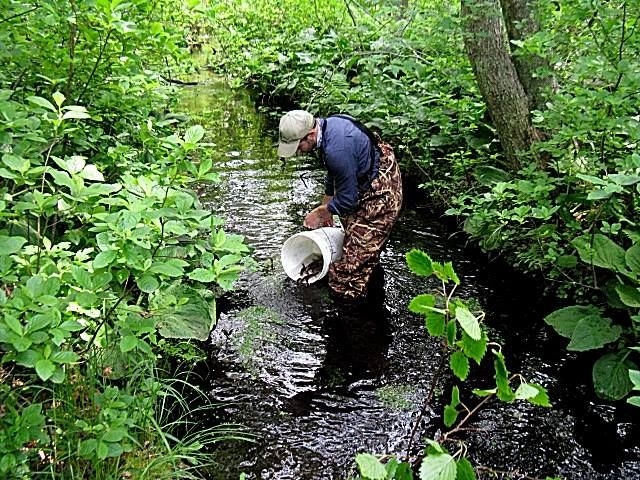 Before leaving, Steve put temp loggers, acquired from Sea-Run Brook Trout Coalition using a grant from Patagonia’s Boston store, into the Pocasset. Roman and Katy camped at Lyman Reserve with permission from the Trustees and spent Monday through Thursday assisting Steve Hurley with a variety of tasks. Roman de Paz, who runs the store’s environmental program, said he was amazed at how much he learned over the course of the four days. 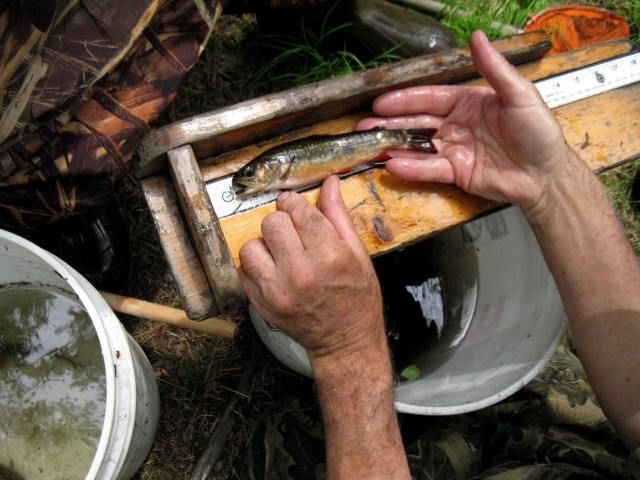 Patagonia and Roman and Katy: many thanks for help with restoring salter brook trout! 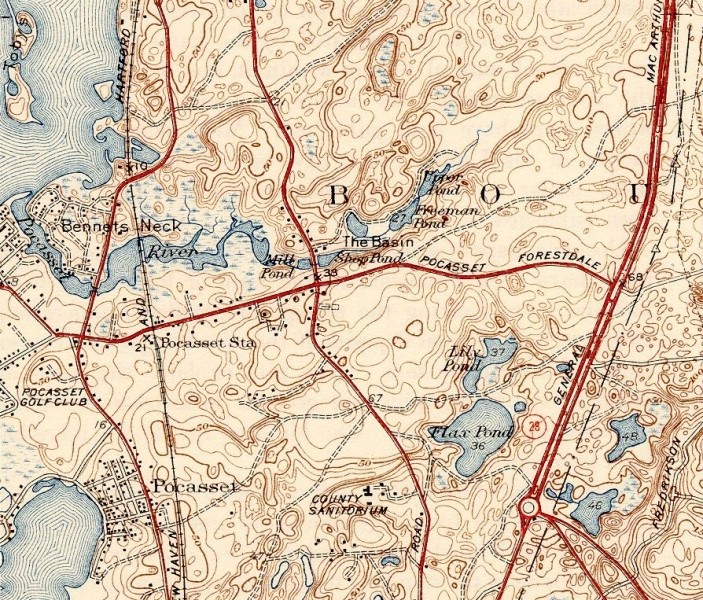 The State of MA listed the Pocasset River as an Area of Critical Environmental Concern in 1980. They cite the “healthy population of brook trout” and a lack of any migratory fish runs there, as well as the presence of diamondback terrapin turtles in the lower estuary. The Pocasset River is a small tidal river and estuary on the eastern shore of Buzzards Bay, in Bourne, Massachusetts, United States. It is located between the villages of Monument Beach and Pocasset along the western coast of Cape Cod. The river flows westward through a series of small ponds and wetlands, with a total length of about 2 miles (3.2 km). The river’s Mill and Shop Ponds were historically used by the Pocasset Iron Foundry (1822–81) and Tahanto Art Works (1882–1900), which made use of the native bog iron. In 1980 the Pocasset River was listed as an Area of Critical Environmental Concern by the Commonwealth of Massachusetts. Alewife spawn during April and May, and the river contains bluefish, flounder, scup, striped bass, blue crab, lobster, and softshell clams.